In our continued exploration of primary sources that can help us understand the past, the Scholars turned to mid-nineteenth-century Irish genre paintings in week 3. Themes of migration and devotion pervade these works. They help us put test out the ideas in the essays by Larkin, Fitzgerald and Lambkin, and Page that we read for class that week. Andrew reminds us that something as simple as a genre painting can presage a much larger set of developments about to change a nation forever. Why might an expatriate Irish painter paint an image of a service in a rural Irish cabin? 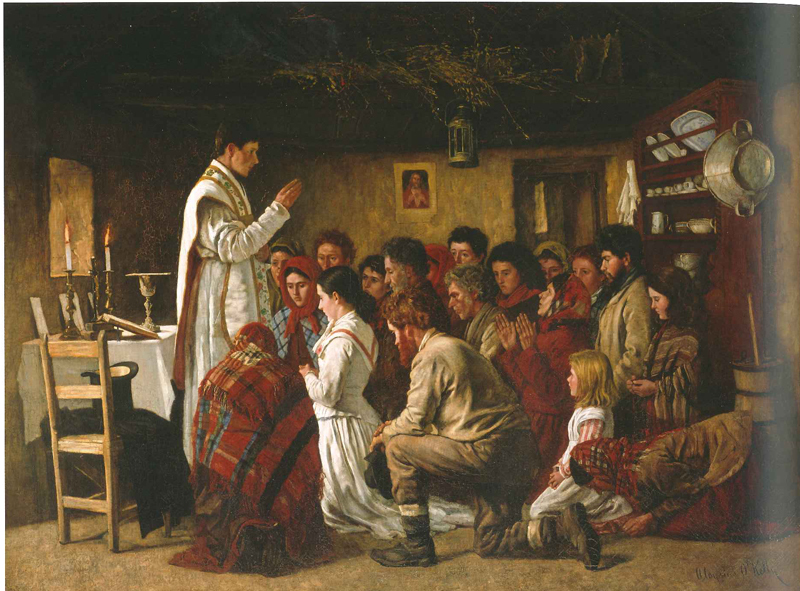 In looking at Aloysius O’Kelly’s Mass in a Connemara Cabin, Claire focuses on an implied critique of the clergy while Guy seeks to uncover the motivations of the laity. Two images created by Erskine Nicol of the migration process – Outward Bound and Homeward Bound – inspired Brendan to think about the paintings’ composition, Susie about the painter’s intention, and Hector about the factors shaping migration. Thomas Hovenden’s Breaking Home Ties effectively communicates the sadness of departure, Maya argues, so much so that even the dog looks sad. Finally, Olivia reminds us that the issues of migration are just as significant today as they were in the nineteenth century. She points to the present migrant crisis in Europe as indicative of more continuity than change. In all, looking critically at visual images forces those of us primarily trained to look at written texts out of our comfort zone. We will see how many scholars return to these types of sources when they launch into their research papers in the spring. ← What Is in a Book?